I guess you would not have landed here if you don’t read about Heartbleed. In case you really don’t know what its all about, catch up here. Since OpenVPN makes use of SSL/TLS (and most distributions use OpenSSL as the implementation of choice), OpenVPN is affected too (check the official page). Most test utilities out there can test HTTP and other protocols, however, I didn’t found a test which validates that a OpenVPN installation is safe. So I created one. You can find the Python script over at Github. My version is an heavily altered version I found at Fox-It created by Jared Stafford and Yonathan Klijnsma. Right now, the utility only supports UDP (which is used by default). The first arguments need to be the test server which then will be contacted and a TLS session initialized. The script then sends a invalid heartbeat request, which the server will respond to if he is vulnerable. 0010 65 64 20 74 65 73 74 20 70 61 79 6C 6F 61 64 E2 ed test payload. 0020 0B 9E 38 34 EC 3D 66 2B 9C D5 63 00 00 68 C0 14 ..84.=f+..c..h.. If the server is patched, the client won’t receive an answer on that TLS heartbeat request, instead the underlying OpenVPN protocol just confirms the reception of the message itself, without transmitting further data. The OpenVPN protocol implements its own lightweight ordering logic and reliability messages (ACKs) which the TLS protocol runs on top of it. My script implements a hacky version of that protocol just to get some packages through in order to find out weather the server handles malicious heartbeat requests or not. Please use the utility with care and only against your own servers! 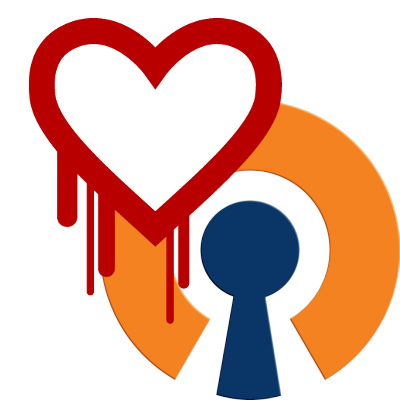 for the Heartbleed bug and the server is VULNERABLE! so i installed the latest openssl-version 1.0.1g but when i use your script again it is still VULNERABLE!! On OpenVPN site it says to update the openssl-library but it not helped! It also hung when run against a server using a static key. @rubiktubik: Did you restart the OpenVPN server daemon?